Cornfield mixtures are composed of annual species that will flower in the first summer after sowing and for this reason they are useful where a colourful result is required in a short time. Cornfield mixtures work on most soil types and, unlike meadow mixtures, do well on fertile soils. In good growing conditions germination will occur within 7 - 10 days of sowing. The above photo of established seedlings was taken in April six weeks from sowing. In a contrasting soils and different sowing dates will however produce different results and no two sowings are ever the same. No management is required between sowing and flowering except perhaps taking the opportunity to control the odd perennial weed. Autumn sowing produces a mass of flowers in June with corn cockle, poppy and cornflower most abundant. Spring sowing favours corn chamomile and corn marigold, producing a later and extended flowering period. After flowering, cornfield annuals produce abundant seed and if left uncut the plants ultimately die with the autumn frosts. It is possible to re-establish a cornfield mixture each year from self-sown seeds by clearing and cultivating the ground to create a new seedbed. Before clearing in the late summer and autumn, and prior to cultivation, there is a good opportunity to spray with glyphosate and rid the land of any perennial weeds such as thistles, docks and couch grass. 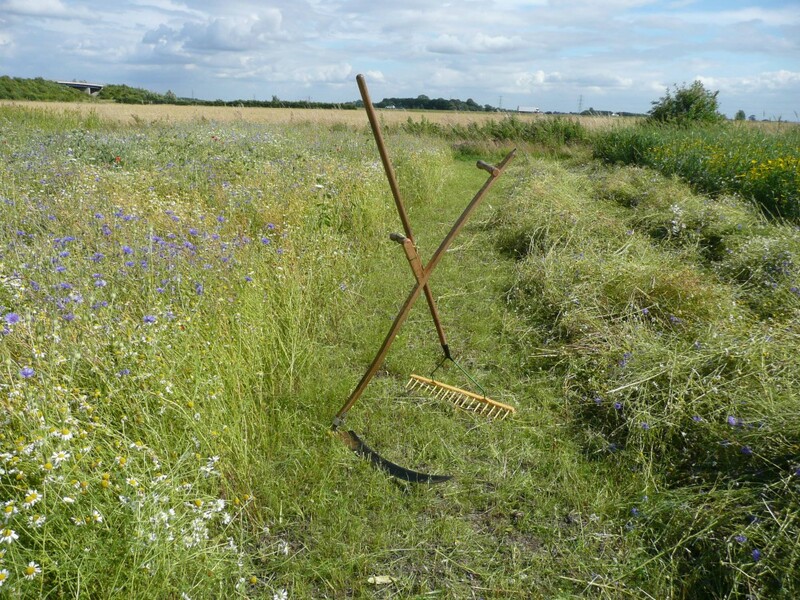 This cleaning opportunity can be very useful between annual sowings or as preparation for sowing a meadow mixture. The new seed bed should be prepared for sowing in the same way as with the initial sowing. Final preparation can take place in autumn or spring; spring work will involve killing off the autumn flush of annuals from the year before. As with sowing from scratch the timing of establishment will determine the balance of species that results. Re-establishing cornfield annuals on the same site works better in some years than others and may be better suited to lighter sandy or calcareous soils. Over time the balance of species changes reflecting seeding success or failure in previous seasons. It is worth topping up with seed of less successful species each year. There will also be an increase in naturally occurring weeds, some of which will not be so attractive. Eventually it may be difficult to create a satisfactory display in the same spot and an alternative planting should be tried such as a permanent meadow or grassland mixture. Where a cornfield mixture is sown with a meadow mixture the cornfield annuals should be cut and removed immediately after flowering in July/August. Do not wait for the annuals to set seed, and if the growth begins to collapse cut and remove as soon as possible or the perennial development will be compromised. Once the annual cornfield nurse is cut back the sown meadow species will be revealed as small green plants, separated by bare ground. These seedlings will then fill out using the light and space provided. Do not spray or cultivate the area. Note that whilst the annuals will have dropped considerable numbers of seeds in year 1 these will not re-appear in year 2 as cornfield annuals cannot establish and survive amongst mature grass.